Yesterday was my birthday. No, I wasn't 36, I'm 57. 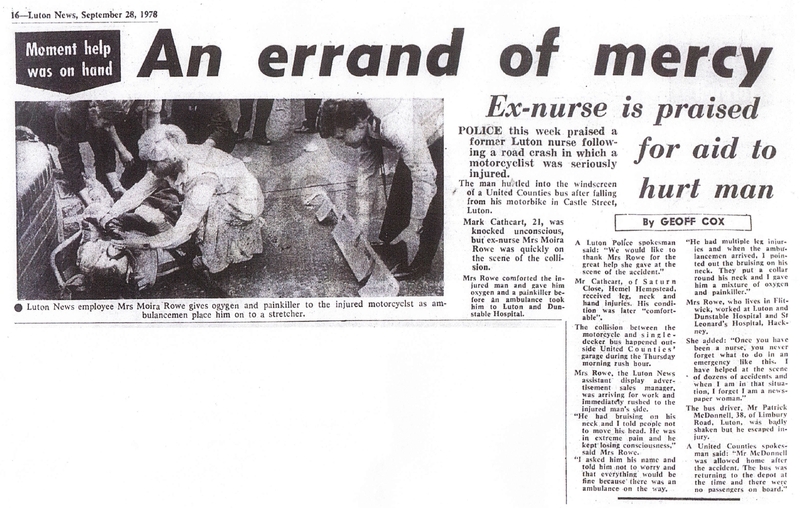 36 years years ago, I was in a medical coma in the accident and emergency ward at Luton and Dunstable Hospital. By coincidence yesterday I received a CD with copies of my latest x-rays, and on reflection this morning I thought I'd take time to write-up at least what I recall, most of it 2nd hand, 36-years ago. I don't recall ever writing it up before. At the time I was working in Borehamwood as a Senior Computer Operator at John Laing the construction company, some 15-miles from the family home in Hemel Hempstead. As a 20-year old, my only practical way of getting to work was by motorcycle. Even back in 1978, most 20-year olds didn't own cars in the UK. To compound the problem, I worked shifts. I'd only worked there 6-weeks or so after a bust up over a promotion with my prior employer, P&O Computer Services. As I recall, I was scheduled to work an afternoon shift on the fateful Thursday(9/21), but in the morning I had to get some work done on my Honda XL250, the original Big Red. I was also going through a golf phase at the time, having been a caddie quite a bit over the past few years. My plan for the day, head to Luton, get the work done on the bike, then spend a few hours playing golf using rented clubs at the public park at Stockwood Park. On the way to the Honda dealership I had to bike down Castle St. When I got to the traffic light at Hibbert St. they were red. I maneuvered up to the front of the traffic line an stopped. I really don't remember anything after that. I have a brief memory of Carole fainting at my bedside in the hospital, memories of good friends like Kim, Steve and Pip, along with Carol, coming to visit me. but really nothing much. 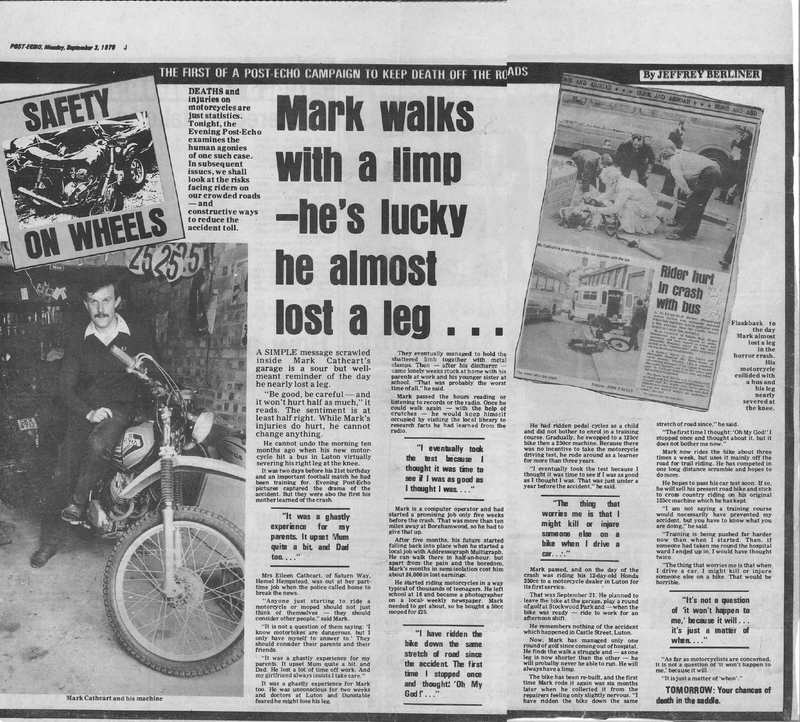 In fact, having looked at some of the press cuttings again, I'm not sure how much I remember, and how much I'm just repeating from them. 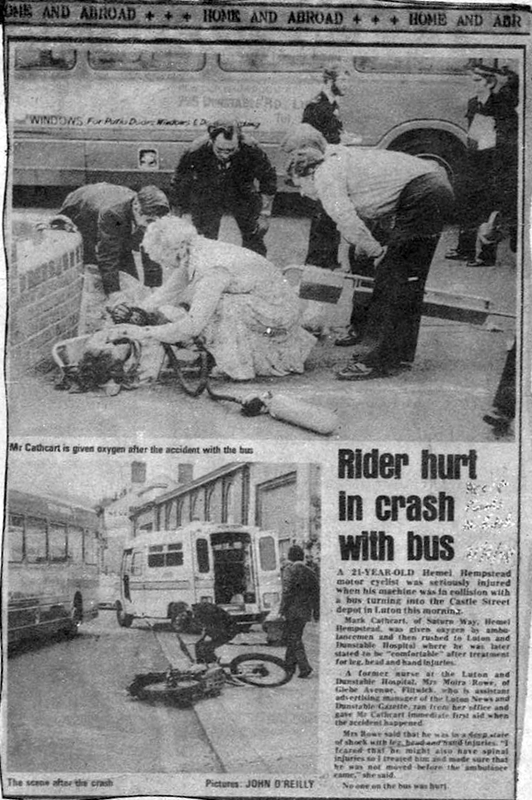 Months later, there was a court case, a bus driver was prosecuted for careless driving. Apparently he was out test driving a double decker bus and did a turn across the road in front of me, I was unable to stop and hit the bus full-on. Except it wasn't quite like that. It seems, from witness testimony at the court, that when the light changed from red to green, I'd pulled a wheelie, and was riding down the road waving at some school girls. That moment of stupidity changed and challenged my life forever. While the court found that I had contributed to the crash, the balance of proof was still that the bus driver caused the accident. I'm guessing it changed his life forever too. The site of the accident, the Luton bus garage has long since been re-developed. 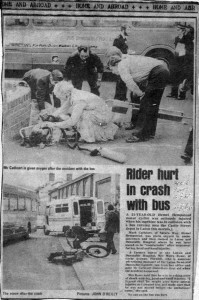 The offices across the street from the bus garage were those of the Luton News. On that day, there was a photographer and the following are pictures and text taken from the write-up to the accident. 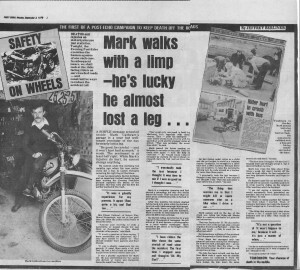 and a follow-up full page feature the local Hemel Hempstead Evening Echo did on me, to launch their motorcycle safety campaign.